Save on Watkins soup and gravy bases in January! When the weather is cooler it’s a great time to cook delicious homemade soups, stews and other one pot meals. With these handy mixes you can whip up delicious home cooked stocks, gravies and sauces without hassle. Real beef, chicken, mushrooms and other wholesome ingredients provide homemade flavor without expensive canned soups and overly-salty bouillon cubes. Convenient: Create delicious meals in a fraction of the time it takes to cook from “scratch”! Lower in Salt: Lower in salt than even most “low sodium” store brands! 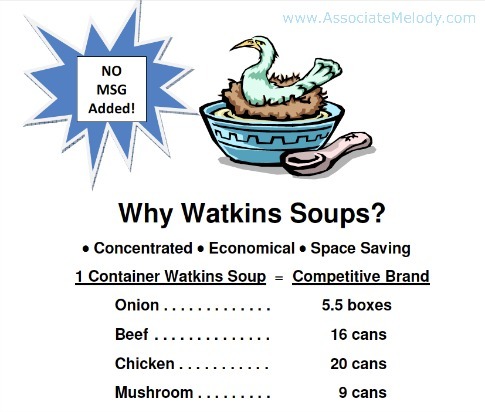 Gluten-Free: Watkins Beef, Chicken and Cream Soups do not contain any form of wheat! Lower in fat: Watkins Cream Soup Base makes white sauce easy and with a fraction of the fat! Versatile: Make soups, sauces, gravies, dips and more! Learn more about Watkins gourmet gravy, sauce and soup mixes and enjoy the Watkins Savory Beef-Mushroom Gravy. These will quickly become your secret ingredient, if they aren’t already for yummy gourmet home cooking! Click below to order yours today! Important note: we are very sorry but our Watkins soup and gravy bases are currently not available in Canada.